Eurovision 2017: Tickets to go on sale Feb 14 The first wave of the much anticipated ticket sales for the 2017 Eurovision Song Contest will begin on Tuesday, February 14 from 19:15 CET. Up to 70,000 tickets for this year's event in May, hosted at the International Exhibition Centre in Kyiv, Ukraine, will be sold across nine shows: six dress rehearsals, two Semi-Finals and the Grand Final of the Eurovision Song Contest, according to the official website of the Eurovision Song Contest. Fans will be able to purchase tickets, priced at various levels between EUR 8 and EUR 500, on the ticketing website Concert.ua. The National Public Broadcasting Company of Ukraine is the Host Broadcaster of this year's Eurovision Song Contest and will be selling tickets for the event in conjunction with V Ticket, the owners of Concert.ua. Jon Ola Sand, Executive Supervisor of the Eurovision Song Contest said: "We are pleased that the tickets for this year's Contest will be going on sale imminently after some delay. We have been assured by the broadcaster that they have found the right partner in concert.ua, and this is the best outlet for the vast array of Eurovision Song Contest fans, who are based all over the world, to purchase their tickets for the much anticipated event this year in Kyiv. We are sure that all those who are successful in purchasing tickets, will be welcomed to the host city and have a great time this May." The 62nd Eurovision Song Contest will be hosted in Kyiv, Ukraine in May 2017 with a record equaling 43 participating countries. The Semi-Finals will take place on May 9 and May 11, with the Grand Final on May 13. In order to help fair distribution of tickets, up to only four tickets will be allowed per purchase transaction, although there is no limit to the number of transactions any one person can make. Ukraine shrugs off threat to Eurovision after resignations Ukraine's preparations to host the 2017 Eurovision Song Contest in May will not be derailed by the high-profile resignations of several organizing members, Ukrainian officials said on Tuesday, according to Reuters. Executive producers Victoria Romanova and Oleksandr Kharebin and several of their team quit on Monday, saying they felt sidelined by the appointment of a new event coordinator and worried by a lack of transparency in decision-making, Reuters reports. They also said a decision to increase the event's budget to 29 million euros from 22 million euros would deprive Ukraine's state broadcaster of 7-8 million euros of profit. "Everything is going on according to the plan," said Pavlo Hrytsak, deputy director of Ukrainian Public TV, adding that organizers were coordinating closely with the European Broadcasting Union (EBU), which operates Eurovision. The EBU said in a statement that it would not comment directly on "staffing matters" but reiterated the "importance of a speedy and efficient implementation of plans already agreed". Criticizing the increased budget, Kharebin, the former executive producer, said in an interview with Ukrainian TV channel 112: "we do not understand, we do not know why it was done. And it is hard for us to imagine how we can be a part of this process." Prime Minister Volodymyr Groysman also weighed in on the resignations. "We are conducting the preparation for Eurovision properly. Absolutely nothing threatens Eurovision," he told a televised government meeting on Tuesday. O.Torvald to represent Ukraine at Eurovision 2017 (video) Every year there is always particular interest in the act representing the host country of the Eurovision Song Contest and this year is no exception. O.Torvald has been chosen to fly the Ukrainian flag in Kyiv with the song Time, according to Eurovision.tv. O.Torvald is composed of lead singer Zhenia Halych, guitarist Denys Myziuk, drummer Sasha Solokha, bass guitarist Mykyta Vasyliev, and DJ Polarnik. The band was founded in the city of Poltava but relocated to Kyiv in 2006 where they began performing to large venues with thousands of spectators. They released their first album in 2008. Andriy Danylko – comedian and singer, represented Ukraine in 2007 as the drag artist Verka Serduchka. Ukraine made its debut at the 2003 Eurovision Song Contest with the song Hasta la Vista performed by Oleksandr Ponomariov, finishing in 14th place. The next year Ruslana with her song Wild Dances took Europe by storm scoring the first victory for Ukraine in the Eurovision Song Contest. Jamala won the 2016 Eurovision Song Contest for Ukraine earlier this year with the song 1944, providing the country with its second victory in the competition. From sand artists to drag acts, Ukraine has sent a variety of musical styles and performers to the Eurovision Song Contest over the years. The video below features the ten most successful Ukrainian entries in the Eurovision Song Contest. From sand artists to drag acts, Ukraine has sent a variety of musical styles and performers to the Eurovision Song Contest over the years. The video below features the ten most successful Ukrainian entries in the Eurovision Song Contest. Russia has chosen Yulia Samoilova to represent the country at the 2017 Eurovision Song Contest in Kyiv, an event some Russian pop stars and lawmakers wanted to boycott. The choice of Samoilova was announced on March 12 on Russia's main state-run TV network, First Channel. The 28-year-old singer who has been in a wheelchair since childhood won with her song The Flame Is Burning. A wildly popular celebration of kitsch and pop music, Eurovision frequently takes on political undertones, despite organizers' efforts to avoid it. Last year's winning entry was from a Ukrainian woman who commemorated the Crimean Tatars deported en masse from the Black Sea peninsula by Josef Stalin during World War II. That victory gave Kyiv the honor of hosting this year's final ceremonies. But that, plus the fact that Moscow annexed Crimea from Ukraine in 2014 and fueled a separatist insurgency in the east, added political drama to this year's decision. Some Russian lawmakers and even pop stars have called for a boycott of the Kyiv ceremony. Ukraine has barred Russia's Eurovision contestant because she performed in Crimea, annexed by Moscow in 2014. Julia Samoilova was banned from attending the event because of her "illegal" visit , the Ukrainian SBU security service said. Samoilova, 27, has confirmed that she sang in Crimea in 2015. Ukraine is due to host Eurovision in its capital, Kiev, in May. The SBU has blacklisted at least 140 other Russian artists. Russia and Ukraine have been at loggerheads since the annexation of Crimea and subsequent fighting in east Ukraine, which Moscow is accused of stoking. Ukraine is hosting the competition after its singer, Jamala, caused an upset by winning in Sweden last year. Her song, 1944, was about Joseph Stalin's mass deportation of the Crimean Tatars during World War Two. The SBU (Security Service of Ukraine) said earlier it would verify information about Samoilova's visit to Crimea and take a decision. The Vice Prime Minister of Ukraine for Humanitarian Affairs, Vyacheslav Kyrylenko, offered Russia the option to choose another participant for Eurovision-2017 that has not violated Ukrainian legislation, as stated on Ukrainian Radio, reports Ukrainska Pravda. Kyrylenko stressed that from the very beginning Ukraine warned that no artist who had violated Ukrainian legislation would be able to participate in the song contest. "Of course, we are ready to accept all 43 Eurovision participating countries, including the representative of the Russian Federation. Russia itself can find a way out of this situation by offering a participant who has not violated Ukrainian legislation. Then this problem will be solved very quickly," he said. However, according to him, Ukraine does not have much hope that Russia will take this approach as it sees "a provocation from Russia over Eurovision as just a small link in a large chain of provocations and actions aimed at forcing the situation in Ukraine." Among such provocations, he referred to sabotage that led to explosions of ammunition in Balakliia in the Kharkov region as well as the murder of a former deputy of the State Duma of the Russian Federation, Denis Voronenkov, in the center of Kyiv. "We define their choice of participant in Eurovision 2017 in the same way," said Kyrylenko. "If Russia doesn't replace the participant and doesn't come Б─■ well, we will hold a high-level Eurovision contest for 42 free and democratic countries," the Vice Prime Minister added. On 22 March 2017, Ukraine’s authorities barred Russia’s entrant to the Eurovision Song Contest from entering Ukraine. The three-year ban effectively prevents Yulia Samoylova from performing at the contest, which takes place in Kyiv from 9 to 13 May. Ukraine’s state Security Service (SBU) imposed the ban because, in 2015, Samoylova performed in Crimea. Since Russia illegally annexed Crimea in 2014, Ukrainian law requires artists wishing to visit the peninsula to first apply for special permission from the Ukrainian authorities. Without it, they are subject to a ban, while their songs – where those artists are singers – cannot be played on Ukrainian radio or TV. In line with these regulations, Ukraine has already barred dozens of Russian and other foreign artists, including G&#233;rard Depardieu and Steven Seagal, from entering the country. Official Moscow, quite expectedly, appeared to be furious. Russia’s Deputy Foreign Minister Grigory Karasin called Ukraine’s move “yet another outrageous, cynical and inhumane act by the Kyiv authorities”. Maria Zakharova, a Foreign Ministry spokeswoman, wrote on Facebook that “the current Ukrainian authorities have once again shown they are a regime infected with Russophobe paranoia and nationalist complexes”, adding that “evidently Kyiv is really scared of a fragile girl”. Zakharova’s remark about Samoylova’s “fragility” is apparently a reference to her disability: Samoylova has used a wheelchair since childhood. The singer echoed Zakharova’s comments by expressing her surprise that Kyiv allegedly saw a threat “in such a little girl” as herself. Despite the legality of Ukraine’s decision, the ban does not do Ukraine’s international image any favours. The European Broadcasting Union (EBU), which produces the Eurovision Song Contest, released a dubious statement saying that “we have to respect the local laws of the host country”, but adding that the EBU was “deeply disappointed” in Ukraine’s decision to ban Samoylova. They “feel it goes against both the spirit of the Contest, and the notion of inclusivity that lies at the heart of its values”. Some international media also seemed to sympathize with Samoylova and emphasize her disability. For example, the BBC reported: “adding to the howls of outrage here is the fact that the singer being banned has used a wheelchair from childhood and this year the slogan for Eurovision is celebrating diversity”. Other major media outlets used the words “wheelchair” and “ban” in the same sentence, subtly implying that Ukraine’s decision was questionable on ethical grounds. However, such reactions from the major international media were apparently exactly what Moscow expected, while the Kremlin’s fury seems to be a choreographed act of the information war that Putin’s regime is waging against Ukraine as part of its wider strategy of hybrid warfare. Official Moscow knew that Samoylova had performed in Crimea and that Ukraine banned Russian artists who had performed there. It chose a disabled person as Russia’s Eurovision entrant in the full knowledge that Ukraine would be compelled to ban her and, thus, sully its own international reputation. Because in the fullness of time, the international audience will look back and remember the fact that Ukraine banned a disabled person, rather than Ukraine’s legitimate reason for doing so. Official Moscow’s actions conform with a Soviet info-war trick called “reflexive control”. Military analyst Timothy L. Thomas defines reflexive control “as a means of conveying to a partner or an opponent specially prepared information to incline him to voluntarily make the predetermined decision desired by the initiator of the action”. The Kremlin presented Ukraine with two options, both of which were mousetraps. Were Ukraine to allow Samoylova to enter the country, it would violate its own law and tacitly recognize the “Russian status” of Crimea. Were Ukraine to stick to the rule of law and ban her – and this is what happened – it would indirectly tarnish its image as a country that adheres to European values. If Ukraine yielded to international pressure and lifted the ban, that would be even better for the Kremlin, which could then argue that Ukraine was a western stooge. That the Kremlin would try to politicize its nomination for the Eurovision Song Contest in Kyiv had long been expected. After all, Moscow simply could not miss an opportunity to deliver a riposte to Ukraine winning the contest in 2016. Last year, the Ukrainian singer of Crimean Tatar origin Jamala won the competition with a song called “1944”, which was widely seen as politically charged: in 1944, the Soviet dictator Joseph Stalin ordered the deportation of Crimean Tatars from Crimea. Reference to Russia’s annexation of Crimea was all too evident. (Some Russian politicians and officials even suggested boycotting this year’s contest in Kyiv). Putting the Kremlin’s ill-will aside, the current situation points to failure on the part of Ukraine on two counts. For it comes as a result of both the SBU’s unsatisfactory work and a lack of creativity in dealing with the insidious opponent. Firstly, it was the SBU’s job to trace all non-Ukrainian artists who performed in Russian-annexed Crimea in violation of Ukrainian law and ban them from entering Ukraine straight away. Had Ukraine already banned Samoylova from entering Ukraine in 2015, when she performed in Crimea, Moscow would not have chosen her for the Eurovision Song Contest and Ukraine would not have found itself in such an inconvenient situation. (There is little doubt that Moscow would have attempted to do something else to damage Ukraine, but that would have been a different story). At the very least, the SBU could have identified potential candidates during the selection process, checked if they violated any Ukrainian laws and banned Samoylova before she became Russia’s Eurovision nominee. Secondly, the very acceptance of the idea that there were only two ways to respond to Moscow’s nomination was already an indication of the success of the Kremlin’s reflexive control operation. By accepting Moscow’s rules of the game, Ukraine could not win, but it could have minimized the damage resulting from the Kremlin’s info-war operation or even turned the tables. As Sergej Sumlenny, head of the Heinrich B&#246;ll Foundation in Kyiv, wrote on Facebook, Ukrainians could have outsmarted the Kremlin: “If for example Jamala met the Russian singer at the airport and told her: dear kid, you obviously do not know at all what happened [in] Crimea before. Let me invite you to my house and tell you the story of my people. And there would be pictures in the media [showing] how Jamala [tells] Yulia the real history, and tell[s] her what [the] Kremlin does not want to be told”. Or, as another commentator wrote, Ukraine could have arranged for the Russian singer to meet with Ukrainian servicemen who were disabled as a result of injuries sustained while defending Ukraine against Russian aggression. Ukraine could have come up with other ideas too. It is undeniable that all of them would have been very political, but – given the circumstances – there is no apolitical way of responding to the Kremlin’s reflexive control operation. Today, there seems to be no solution to the problem of Russia’s Eurovision contestant. Following the Ukrainian travel ban, the EBU made an unprecedented move and offered Russia the opportunity to have Samoylova participate in the contest via satellite. As the EBU argued, this would be “in the spirit of Eurovision’s values of inclusivity” and this year’s theme of celebrating diversity. Moscow rejected the EBU’s offer. To a certain degree, this improves the otherwise inconvenient situation for Ukraine, since it is now Russia rather than Ukraine that is throwing sand in the Eurovision machine. Nevertheless, the overall situation is far from having been resolved, and Moscow will likely continue using it to damage Ukraine’s international image. Another batch of tickets for the Eurovision Song Contest 2017 shows will go on sale on the website of the official ticket agency Concert.ua on Monday, April 10. The tickets for all the shows, including the Grand Final to be held on May 13, can be bought here, the press service of UA: Pershy reported on Tuesday. "The demand for the tickets for the Grand Final at times exceeds the supply, but the tickets for the off-the-air concerts are still available. So if you want to see the world class show for yourself, we recommend looking closely at the dress rehearsals," official Eurovision 2017 spokesman Pavlo Shylko comments on the hype surrounding tickets for the shows. As the event organizers remind, nine shows will be staged within the framework of the Eurovision Song Contest 2017 in the International Exhibition Center in Kyiv. Two semi-finals (on May 9 and May 11) and the Grand Final (on May 13) will be broadcasted live. During the dress rehearsals (of Semi Final 1 on May 9 at 4 p.m. Kyiv time, Semi Final 2 on May 11 at 4 p.m. Kyiv time and Grand Final on May 13 at 2 p.m. Kyiv time), the viewers will see the same performances, which will later be shown live. This is a great opportunity to visit the concerts with children, besides, the tickets for these concerts are several times cheaper than for the rest of the shows (starting from UAH 219), the organizers mention. The organizers of the Eurovision Song Contest 2017 also warn that the secondary ticket market intensifies, when demand exceeds supply, and Eurovision is no exception. "You can find tickets for semi-finals and Grand Final show at a price much higher than the nominal price. When buying a ticket, you risk buying a fake or a copy of the original, so be sure to buy only from the authorized partner Concert.ua," the statement reads. It is a month to the unofficial opening of the Eurovision Song Contest-2017 in Kyiv. Euroclub (in the Congress and Exhibition Complex "Parkovy") would be opened on May 1, and the official opening ceremony is on May 7. Accordingly, the final would be held on May 13. Let us understand what, where, and when is happening on the eve of Eurovision in the Ukrainian capital. The traditional and important event in the hierarchy of Eurovision is the RED CARPET. It would officially deployed in Kyiv in the area of the Mariinsky Park, on the 7th of May everyone would be able to see the delegation of the European competition from different countries. It is expected that the red carpet would have 265 meters! Representatives of 12 countries would stand on it at the same time. In the Mariinsky Park area they would give interviews and autographs. Meanwhile, the Mariinsky Palace is not yet ready for hosting European elite. Its opening (after reconstruction) is expected only in 2019. But the arrival of foreign delegations (for Eurovision) is promised to bring the fa&#231;ade of this architectural pearl to a perfect view. The most important location in the infrastructure of the future Eurovision is Euroclub. Let us remind you once again that it will be located in the Parkovy Exhibition and Convention Complex at 16-a Parkova Road. Parkovy itself can accommodate about 3,500 guests and participants. According to Eurovision standards, Euroclub is one of the most important locations: for parties and active dialogue of participants. Seven thousand square meters of Parkovy should be enough for the club life. The building is equipped with elevators, ramps, and parking. On the ground floor, there are souvenirs with logos. The screens would broadcast the show, show regular meetings and autograph sessions. And also lectures and other events. A Euro-caf&#233; opens here. The third floor of Parkovy will host a press room, where the accredited press will be able to accommodate. A special game zone is also planned. In addition to the contestants, accredited media representatives and accredited fans would be able to get to Euroclub. The opening ceremony on May 7 will be accompanied by the National Academic Orchestra of Folk Instruments, performing a medley of Eurovision hits of different years. Everyday AFTEPARTIES (in Euroclub). Here, the festival of Ukrainian DJs, as well as musicians from other countries, will be held. KARAOKE (for the glory of Eurovision) to take place on Poshtova Square. Within the framework of this location, the organizers will offer a music program based on the history of Eurovision. Anyone wishing would have an opportunity to sing the Eurovision repertoire of ABBA, Dima Bilan, Ruslana, Verka Serdyuchka, Lorak, Karol and even Alla Pugacheva. From 4 to 14 May in the center of Kyiv Eurovision Village will operate, the official fan zone of Eurovision (along Khreshchatyk from Prorizna Street to Bogdan Khmelnitsky Street). Every day the Eurovision Village will be open from 12.00 to 22.00. In the days of the semifinals and finals, the official fan zone will work until the show is over. Four screens will convey to fans everything that happens on the main arena of Eurovision - that is, on the Left Bank, that is, in the International Exhibition Center. The entrance is free in Eurovision Village. The main stage of the Eurovision Song Contest-2017 is the International Exhibition Center at Brovarsky Avenue, 15. It is the heart of the Eurovision; it would host the rehearsals, the first and second semi-finals, and, of course, the final on May 13. The Eurovision stage at the International Exhibition Center suggests an interesting concept. The venue, according to show producer Stuart Barlow, will symbolize the canvas on which the artist will be able to give birth to different-different images. That is, a new original world appears on this canvas. The world of the song, the world of the country. TICKETS on the Eurovision Song Contest began to be sold since the middle of February. According to some sources, the organizers of the contest expect to sell about 70,000 tickets, earning about 70 million UAH for them. The cost of tickets is from 8 to 500 euros. The official operator is Concert.UA. The largest DEMAND is for the final show of May 13. The tickets for rehearsals and for the semi-finals are also available. According to some reports, 52% of the sold tickets were purchased by Ukrainians, and 48% by residents of other countries. In total, tickets for 9 shows are available: final, two semi-finals and six rehearsals. The organizers say that the rehearsals do not differ from the evening television shows, except for the final voting on the air. GUESTS: organizers of the Eurovision contest expect more than 20 thousand tourists from 50 countries; At least 10 thousand people from different regions of Ukraine can also come to the show in Kyiv.1,5 thousand representatives of the media would participate. Kyiv has additionally purchased an important TRANSPORT: 20 trams and 100 buses. To relieve the metro and other transport lines, a river communications will be used. Tickets for this transport would be from 100 UAH. At the same time, 47 ambulances will be equipped with GPS navigation systems. Additional 4 thousand CCTV cameras and a data center would be instaleld. The main HOTELS of the contest were selected by the National Technical University (together with the company "Pilot", the official tourist operator of the contest). The criteria for such selection are the level of security, convenience of placement, price policy. The list of official hotels includes 12 (four- and five-star): Premier Hotel Rus, Cosmopolite, President Hotel, Holiday Inn Kiev, Alfavito, Khreschatyk, Fairmont Grand Hotel, Hilton, Hyatt Regency, InterContinental, Premier Palace Hotel, Opera. RIDERS of the arriving contestants would contain no sensations. None of the participants of the Eurovision Song Contest has any grounds to put forward special requirements, as, for example, it happens at concerts and tours of world superstars. BOOKMAKERS called Italian singer Francesco Gabbani with the song Occidentali's Karma the main contender for the victory. According to the coefficients, Swedish singer Robin Bengtsson with the song I Can not Go On is in second place. The third place is for the representative of Bulgaria Christian Kostov and his song Beautiful Mess. The top ten winners, according to the bookmakers, may include Russia (if it participates in the competition). Ukraine, unfortunately, is still supposedly on the 26th place. Recall that in the final of the Eurovision participants from 26 countries will perform: 10 from each semifinal; Representatives of the Big Five (Germany, France, Spain, Italy, Great Britain) and Ukraine as the host country. On the eve of the final competitive race, Jamala will sing her song "1944", which brought her a victory a year ago. Russian Channel One has said that it will not broadcast the Eurovision Song Contest this year because of the refusal of the Ukrainian authorities to let the singer Yuliya Samoylova enter the country to participate. This was announced in a news broadcast from Channel One, reports Russia’s Interfax news agency. "Today, Channel One received a letter from the European Broadcasting Union (EBU) informing us that the EBU was unable to resolve the issue of the participation of our contestant, Yuliya Samoylova, in the contest in Kyiv; the EBU reports this with reference to the decision of the Security Services of Ukraine (SBU)," said the presenter. Channel One stated that they “consider the refusal of the Ukrainian side to be absolutely unreasonable; the cause for it is Ukraine's attempt to politicize the contest, whose goal for its 62-year history has been the unification of people." "The European Broadcasting Union continues to offer us the option of Yuliya Samoylova's remote participation or replacement by another participant, but Channel One considers both options unacceptable: a remote performance discriminates against the Russian participant and runs counter to the rules and principles of the contest, and the option of replacing Yuliya Samoylova with another performer, in our opinion, cannot even be considered," emphasized the First Channel. The Chairman of the Eurovision supervisory board, Frank-Dieter Freiling, commented on the decision of Channel One: "We strongly condemn the decision of the Ukrainian authorities to impose a ban on the entry of Yuliya Samoylova, because we believe that it completely undermines the integrity and non-political nature of the Eurovision Song Contest and its mission is to unite all nations through friendly competition,” he said. "Unfortunately, both proposals were rejected by ‘Channel One’. Therefore, Russia will not participate in the 62nd Eurovision Song Contest. We very much wanted all 43 countries to be able to take part in the contest this year and did everything possible to achieve this,” said the EBU in response to the request of RBC news agency to comment on Channel One’s statement. Ukraine’s National Public Broadcasting Company issued a statement in response to Russia’s refusal to broadcast the contest. “The refusal of the Russian First Channel (Russia) to broadcast Eurovision proves that, notwithstanding the declared respect for the fundamental values of Eurovision, the key among which is mutual respect and political neutrality, the aim of the Russian side was not to compete at the outset, but to create a negative information atmosphere around the preparation and conduct of the contest,” the statement of the National Public Broadcasting Company reads. At the same time, Yuliya Samoylova told RBC that she was very upset that the European Broadcasting Union was unable to resolve the issue regarding her participation in Eurovision. "But I believe that in the future I will definitely go to this contest from Russia, to another country," the singer said. Russia was to be represented at the Eurovision Song Contest 2017 by the physically disabled singer Yuliya Samoylova. Russia has isolated itself from the Eurovision-2017 singing competition that will be held in Kyiv, as stated by the Vice Prime Minister of Ukraine, Vyacheslav Kyrylenko, on Ukrainske radio. "Russia has isolated itself from Eurovision-2017. Moreover, as a result of this decision, the Kremlin has deprived all Russian people of the opportunity to see this fantastic and wonderful show, in which 42 countries not only from Europe but the whole world will take part," Kyrylenko said. "But we also know that millions of Russians, thanks to satellite television and the Internet, and regardless of the will of the Russian authorities will watch the broadcast of the contest from Ukraine, from Kyiv." According to Kyrylenko, preparations for Eurovision in Kyiv are accelerating. In the International Exhibition Center where the event will take place, hundreds of specialists from different countries are at work. The audience stands are already being set and the main stage is almost built. It weighs 30 tons, is 14 meters high and 17 meters wide. The facility stands 28 meters deep, taking up a floor area of 350 square meters. "Several more unique things will be offered by Ukraine at the current Eurovision Song Contest, and all those who have goodwill, who want peace and friendship all over the world and in Europe, will participate in the contest and will watch it," Kyrylenko summed up. Kyiv police release safety tips for Eurovision guests The National Police of Ukraine has published on its website a set of safety tips and recommendations for the foreign guests of Eurovision 2017. The National Police wrote the recommendations were aimed to ensure a comfortable and safe stay in Ukraine for all Eurovision guests, according to the message released on its website. The set of safety tips and other pieces of advice consists of general recommendations as well as tips for those traveling with children, willing to rent a vehicle, or encountering threatening situations during their visit. A list of responsibilities for any foreign visitor being a witness of or complicit in a felony or other wrongdoing is also made available. - Do not drink alcohol in public places (streets, parks, stadiums, railway stations, airports, public transport etc. ), while driving or with strangers. The capital authorities have approved a program of cultural events for the period of holding of the Eurovision Song Contest 2017 from April 30 to May 14. This has been reported by the press service of the Kyiv City State Administration. "The capital authorities have approved the program of cultural events for the Eurovision period. Kyiv residents and guests will enjoy a variety of activities, workshops, festivals, exhibitions, etc.," reads a statement. Thus, from April 30 to May 14, the fan zone will be organized on Sofiivska Square, which can accommodate up to 10,000 visitors. The fan zone will be divided into cultural, art, information, recreation, entertainment zones and food courts. The city guests will be able to get acquainted with unique Ukrainian culture, national music, contemporary music and theatre works on Troitska Square. There will be held the classical music concerts with the participation of the operetta theater orchestra, the performances of jazz musicians and folk groups. Everyone interested will be able to visit master classes, exhibitions, kids activities. Photo zones, tourist information center and food courts will also operate there. Kontraktova Square will host the Feel Ukraine cultural and artistic project. The motifs of Ukrainian embroidery will be used in the decorations of all the stages and zones. Every day will be dedicated to a separate topic: jazz day, master classes day, Ukrainian literature day, fine art day, costume and jewelry day, and so on. The Eurovision: Retrospective cultural and art project will be located on Poshtova Square. Karaoke festival will be held there for all guests. Everyone will be able to participate in the festival. The Art Kyiv Fort 2017 fan zone will be open on the territory of the National Historical and Architectural Reserve "Kyiv Fortress". The area will be equipped with temporary spherical tent structures that will be placed on the esplanade, imaging the Eurovision 2017 logo. From May 4 to May 7, the guests of the Eurovision Song Contest 2017 will be able to visit the Kyiv Art Week. The Toronto-Kyiv business center will be the main location of the festival in 2017, which will host the International Art Fair "Kyiv Art Fair", the exhibition "Museum of Private Collections" and the special project of BIRUCHIY art residence. From May 5 to May 14, the Lavra Kyiv Art Gallery will host the International Art Festival "Face of Art". In addition, Kyiv Light Fest 3D mapping show will be held as the international light and media art festival from May 12 to May 14 on Kontraktova and Poshtova squares, as well as in the park of Kyoto. The best hotels in the capital are ready to accommodate 1,500 representatives of the official delegations coming to the Eurovision Song Contest 2017. The list includes six five-star hotels, five four-star hotels and three-star hotel "Rus", which has the excellent location and the quality-price ratio. All the hotels are equidistant from the main arena of the contest – the International Exhibition Center, as well as other locations such as the EuroClub and the Eurovision Village. 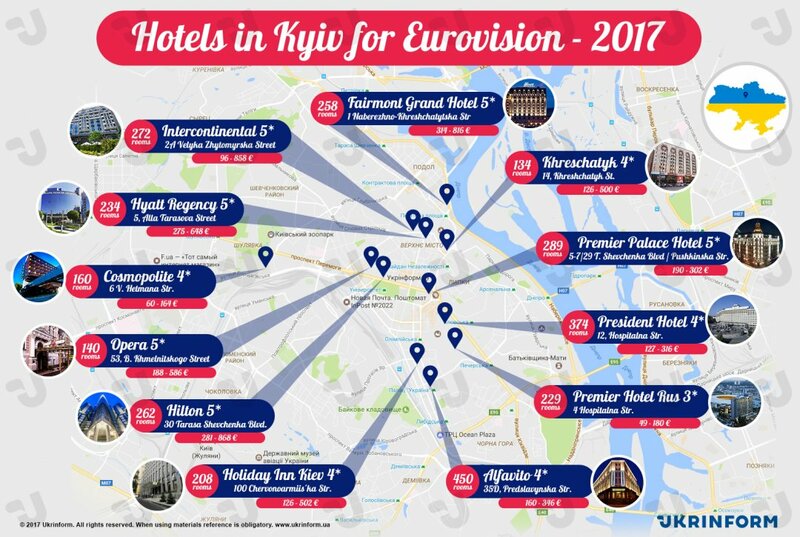 So, the list of the official Eurovision 2017 hotels includes five-star hotels Intercontinental, Premier Palace Hotel, Fairmont Grand Hotel, Hilton, Opera, Hyatt Regency; four-star hotels Khreschatyk, Holiday Inn Kiev, Alfavito, President Hotel, Cosmopolite and three-star Premier Hotel Rus. The hotel is situated in 2A Velyka Zhytomyrska Street, a truly prime location in Kyiv city, where the capital’s central business and historical districts are united. InterContinental gives an excellent opportunity to enjoy marvellous views, exceptional service and conference facilities. Built to match its historical surroundings – St. Sophia's and St. Michael's Cathedrals, the hotel offers 272 comfortable and beautifully decorated rooms designed to satisfy the most pretentious guest. The guests are also offered to enjoy the services of SPA centre, fitness centre and beauty salon. The room cost: UAH 2,736-24,444. The hotel is situated in 5-7/29 Shevchenka Boulevard, only100 meters from the main street of the capital, Khreshchatyk. From the windows of its suits and restaurants, you can see the well-known golden-domed temples: St. Volodymyr’s, St. Michael’s, and Saint Sophia’s Cathedrals. Within walking distance, there are several art galleries, museums, parks, shopping and business centers. The Premier Palace Hotel offers 289 rooms. The room cost: UAH 5,423 – 8,616. The hotel is situated in 1 Naberezhno-Khreshchatytska Street in the heart of the city’s historic Podil district, on the Dnieper River. The guests can experience extraordinary comfort and exquisite cuisine, indulgent spa treatments and spectacular function space. The Fairmont Grand Hotel Kyiv offers 258 guest rooms. Within an atmosphere of pure elegance, guests will be treated to magnificent amenities and anticipative service. The room cost: UAH 8,954 – 23,252. The Hilton Kyiv hotel is situated in 30 Shevchenka Boulevard and boasts a convenient location within walking distance of many major Kyiv attractions such as Shevchenko Boulevard and the Old Botanical Gardens. View famous monuments on Sophia Square, shop along Khreshchatyk Street or take in a performance at the Opera House. The Hilton Kyiv hotel offers 262 rooms. The room cost: UAH 8,014 – 24,736. Located in 53 Khmelnytskoho Street, in the heart of Kiev at the crossroads of the city's business, cultural and historical districts, the boutique Opera Hotel is within walking distance of the Opera House, St. Sophia and St. Vladimir churches and Kiev’s main business and Embassies district. The hotel offers 140 rooms. The room cost: UAH 5,365-16,704. The Hyatt Regency Kiev is located in 5 Tarasova Street in the centre of Kyiv. Overlooking the breath-taking Old City, which features many of Kyiv's main historical and cultural sights, the hotel is within walking distance of Saint-Sophia's Cathedral, Saint-Michael's Monastery and the boutiques of the Khreshchatyk Street. The hotel offers 234 rooms. The room cost: UAH 7,843 – 18,462. The hotel is located in 14 Khreshchatyk Street, only a minute away from Maidan – the main Square of the country. The prime location of gives a wonderful chance to discover major attractions of Kyiv, diverse eating scene as well as vibrant night life. The Khreschatyk hotel offers 134 rooms. The room cost: UAH 3,600 – 14,249. Holiday Inn Kiev is part of the Intercontinental Hotels Group network, which has more than 5,000 hotels worldwide. The hotel is conveniently located in 100 Velyka Vasylkivska Street in the business center of the city next to the St. Nicholas Church. Holiday Inn Kiev offers modern and comfortable rooms of three different categories. The Holiday Inn Kiev hotel offers 208 rooms. The room cost: UAH 3,601-14,306. The elegant Alfavito Kyiv Hotel is located in 35D Predslavynska Street in one of the business districts of central Kyiv within 15 minutes’ walk from the central main street, Khreschatyk and Maidan Nezalezhnosti and only 10 minutes’ walk from Olimpiysky Stadium. The hotel offers 229 rooms. The room cost: UAH 4,560-9,860. President Hotel is located in 12 Hospitalna Street in the downtown of Kyiv. It will take you 15 minutes walk to the main square of Kiev – Maidan Nezalezhnosti. The hotel has a great territory and extensive service infrastructure. The hotel offers 374 rooms. The room cost: UAH 3,631-9,005. The Cosmopolite hotel is situated in 6 Hetmana Street and gives a great opportunity to appreciate the inspiring atmosphere of Kyiv. It is created by distinctive design concept built on the pieces of avant-garde art of the early 20th century. The hotel offers 160 rooms. The room cost: UAH 1,729 -4,660. Premier Hotel Rus is a charming hotel, which is situated in 4 Hospitalna Steet in a prime location in the centre of Kyiv. The guests of the hotel will have easy access to the Kyiv Olympic Stadium, the Kyiv Planetarium and Museum of Western and Oriental Art. The Kyiv Shevchenko University, the Kyiv Opera House and the Ukrainian Parliament Building are also within walking distance. The hotel offers 450 rooms. The room cost: UAH 1,391-5,130. All times are GMT+1. This page was generated at 01:27.